The brand name Ancient Audio is not unknown to me. I say even more – I know it quite well. And when talking about that I would even say it is close to me. Maybe even not the company itself (although this separation is academic in nature) but its products. I use for quite some time the player Lektor Prime in my system (test HERE ). This is a phenomenal device, incredibly versatile and true, giving the impression of top hi-end at a still acceptable (for top hi-end) price. It is not the most expensive player from the Krakow based manufacture. From the beginning, I mean from when it was offered, the top player was and is the Lektor Grand. And it was an incredibly good device. I tested it for “Audio” (10/04) about three and a half years ago, so I knew it quite well. This player is also the basis of a system at one of my friends, a member of the Krakow Sonic Society, where we often meet to discuss a burning topic. So I knew it not only from my own system. And as long as the Prime was not on the horizon, the Grand successfully stood ground compared to the best products that reached us, but players like the previous system from dCS, split player from EMM-Labs or Mikado from Gryphon showed something that the Grand could not do (please see also the articles HERE and HERE). If one product could have been made from all those, then it would shatter the Krakow design, but in isolation they were just propositions ‘besides’, and not ‘above’. Especially big response earned the comparison of the Grand with the last of the mentioned players – the Mikado is a player, that handles bass like no other. It is clean, strong and dynamic. After direct comparison I wrote, that the “bas from the Lektor is slightly loosened”. I was really amused later on, what conclusions were drawn from that sentence by the readers, because it was clear, that they had no lessons at school on reading and understanding, and later on it just went on somehow… And my opinion related to bass was told in context of the best players I ever heard in that aspect, the mentioned Gryphon and the dCS Delius converter accompanied by the company drive. Every other player sounded compared to the lector as if the bass would be from a wooden box (I exaggerate, but this is just to show the disproportion). And this is how tests should be read – they always relate to a certain price category – and in this case – to the ‘wall’, to the best products in the category we know. Anyway, it could have been heard, that some things can be bettered. Then the Prime arrived. Smaller, sleeker (the Grand is composed of 3 chassis – a drive and two mono D/A converters) and sounded in a way that made the more expensive device, while still a hair better in some areas, not worth the money, as the Prime was much cheaper. But Ancient Audio is a company that improves its devices, over and over, and all ideas can be implemented in the older players at any time. My Prime went over five upgrades, two more are still waiting, that are commercially available. So, one step behind the other, the new Grand was born. The project was accelerated – one might say it gained power – when the company received an order for a complete system from the billionaire, living in USA, the owner of Kingston Technology, John Tu (the description of this adventure HERE). This allowed for buying all of the needed components and experimenting. Enter the Lektor Grand SE. It is so, that being on this price level, meaning around 100 000zl and above per unit, we have no other choice than buy customized products. Janusz, the first owner of the Grand says that if we want to buy a high class suit we need to go to the tailor. Same with a wedding dress. It is not a fully comparable situation, because and audio device should be universal, and not fitted in just one system, but there is something it this statement. I think, that it is more about the possibility to make enhancements or corrections after the purchase. Most companies offer those, because dCS and EMM Labs offer software and hardware upgrades. But those changes do not come often – twice or thrice in a products lifetime. In case of companies like Ancient Audio those are actually a continuous process – as long as the company will exist, or its ‘brain’ will live (I mean Mr. Waszczyszyn) newer, better versions will appear and will be available for the owners of previous versions. It is probably the best way of bringing to life the idea of a product growing with the company and the user. I listened to many of the best digital players that are manufactured. But not to all of them. I did not hear the Metronome Technologies Kalisto, devices from Zanden, or Reimyo (although those are on the way for testing), or Weiss (those are also ordered). Even more – I haven’t listened to the newest top offering from dCS. On the other hand I know all those devices from shows and demonstrations. This is not equal to a listening test at home, but it gives some idea. So I tell from the very beginning, that I did not hear everything that is available in the digital heaven (or hell as the vinyl lover will probably say). But I think, that my experience allows me to draw some conclusions, at least for my own usage. Until now, the best Compact Disc source I ever heard (this is my opinion) was the four box Jadis system (test HERE), that I liked better than the previous version of the Grand, what I also mentioned in my texts. But I think, that the Lektor Grand SE is a class on its own. Now I hear, that the brilliant midrange of the French system was a bit ‘boosted’, a bit more saturated than it probably (this is always only an approximation) should be. This is still an outstanding player, and if I had the money I would buy it even today. But I think, that the Lektor sounds, while keeping all the assets, in a more neutral way. Maybe that was the reason for the Grand SE not knocking me down immediately, I listened to it interchangeably with my Prime, and although it was clear from the first sound that this is a player from a ‘different tale’ still I did not start thinking about selling my Prime and start negotiating the price with Mr. Waszczyszyn. That came later and in addition it is not so obvious. In the sound of the top Ancient Audio player there is nothing that could be regarded as obtruding. Such devices, and those were among others the Jadis, CD12 from Linn, gain the hearts of the listeners quickly. When I put on the disc Sonny Rollins & The Contemporary Leaders (Contemporary Records/JVC, VICJ-61337, K2 HD, CD) I fell immediately in the dense, warm sound of the leader’s saxophone. This is good – this is very good playing. But if we listen afterwards to something like the new Lektor, we’ll see, that there is more. And this is even not about detail. The Grand is incredibly resolving, this is absolute top in that aspect, but it does not do this in the way like Esoteric or the former generations of dCS did it, by putting everything on one bet. No – here the resolution is not used to extract the details on their own, but to reveal the whole spectrum, details in context to other details, creating a new quality, detached from the details, because those come together to create something bigger. This is why I was struck by one brilliant disc – the Jean Michel Jarre album Geometry of Love (Aero Prod/Warner Music, 60693, CD), god only knows why issued under the name Project by Jarre. This is electronic music, not a refined production, but the depth of the sound, the planes sticking together, the texture of the sounds were outstanding. I think that Jarre himself never heard it this way. The refinement of the Krakow made player can be seen for example in terms of dynamics. I a quick comparison with the Prime it seems that the latter is quicker and can hit harder. This is a mistake. This is just like a woman with more makeup seems more attractive in a pub than one with none. Also the people concentrating the focus of everybody on them during a meeting, the animators, are not necessarily most interesting and intelligent. The Ancient is a ‘deep’ device in terms of emotion, but does not overexpose anything, rather suggesting, counseling than pushing. The Prime makes some shortcuts (this is true for every other player excluding the Jadis). When it hits, it hits, quickly, precisely, but without any pre-thought. The Grand SE has everything planned – the hit, the reverb and it does that with perfect timing and playing in a void. I do not know how to explain that, but the impression is that the Prime, and earlier the dCS and the Gryphon would quicken the events. This is of course not possible, but it is may mean that the Grand SE shows every element with equal attention. The Prime accents the attack a bit, slightly contouring the sound. Nothing like this can be found with the Grand SE. Sometimes, some discs may seem more interesting with the cheaper player. That was the case with the beautiful disc of Bill Evans and Jim Hall Intermodulation (Verve/Universal Music Japan, UCCV-9342, CD), not very well recorded, with cut frequency range and flattened dynamics. But there is much music on it and the Prime released it. And we can just proceed like that, because every detail, every element of the sound requires description and attention, because it is exceptional. To not over inflate the text I just tell about two ‘bigger’ things – space and the top range of the frequency range. No player I know has such a deep and natural stage. I do not write ‘thorough’ on purpose, because in this case this is a subordinate element, a consequence of truthfulness. In the Ancient player every sound has its unique signature, timbre, character, temperature, etc, as well as its special relationship with the space around it. This player shows many such ‘micro-spaces’ around the performers, and all is shown as one happening. The air is ‘thick’ but not Jadis like, where it also was slightly sweetened. Here it is dense because it is deep and not ‘over saturated’ (please remember, that we are talking about top sound here, and the descriptions do not have anything in common with descriptions of cheaper devices). It is often said, that walls are ‘visible’ – please believe me this is only an approximation of that what can be heard. Listening to the Grand SE I caught myself many times thinking, how much information is encoded on such a bad medium like Compact Disc – things that when using common sense should not be there! Depth, width, gradation, fullness, this is also audible on monophonic recordings (yes! ), as well as with Saxophone Colossus Sonny Rollins (Prestige/JVC, VICJ-60158, XRCD), and on early stereo, like on the disc Mulligan Meets Monk (Riverside/JVC, JVCXR-0032-2, XRCD) and on contemporary pearls like the recordings from the sampler Stockfisch Records Closer To The Music. Vol. 2 (Stockfisch, SFR 357.4006.2, SACD/CD; review HERE). I think, that this is related to the phenomenal leading of the treble. In my opinion the cleanness, fullness, saturation, ability of showing the weight of the brass, the place where it is hit by the stick is better than in any digital player I heard. Even the Jadis cannot do that – in the French player the treble is sweeter and slightly creamier. Ancient does not better anything. The Prime does the same, but it does not penetrate the sound that much, the brass is not that three-dimensional. And no sharpness. This is the thing that in some systems may irritate in the Prime. The Grand SE does not have that. After reading the first sketch I realized, that I forgot about the Accuphase DP-700 player. And this would be a big mistake and injustice. If you do remember the comparison of that device with the earlier version of the Grand (without the V-Caps on the output and the Base below the drive – review HERE), then you know, that the showing of the ‘winner’ was not that easy. In longer listening sessions, when it is known which one is playing the Grand had top hand. In short samples, A-B comparison in a blinded setting, the DP-700 was shown as the more pleasing source. It seems that the Lektor lacked deepening of the tone and some ‘honey’ in the treble. I think that the Grand SE does that and even more. But this is only my supposition, because I did not compare the players directly. So it is worth to listen to both players before making the final decision. And this is the truth. I heard a few readers connected to a high class converter, and the sound was better, sometimes by much, than with the players it was recorded from (in both cases the same converter was used). I think that this is the future of the audio, also the hi-end. The transport is the weakest link in the digital player chain. But let’s stay calm. I know that for long. I digested that, and I think that this can only enrich us. For all people that have a large CD collection there is no choice – they have to have a hi-end player for them. Last month in the Lead Article (lead articles in Polish in PDF are HERE) I wrote a lot about collecting in the aspect of our hobby – for all people that have real collections the physical carrier will be there for a long time and they will need to have a player for them. I think that a solution would be a device with a drive and a card reader. It would have to be setup in a way, that the CD would be ripped to the Flash memory and played from it and not from the drive. This would be a kind of a buffer. Players of that kind were presented by companies like Boulder, in the form of the1021 player, or Bel Canto CD-2. Such a hybrid player would guarantee the best possible sound from a CD and allow us to use newer technologies including material in the 24/96 format. But until that, a hi-end CD player is not to be omitted. At least I will not be able to do that. 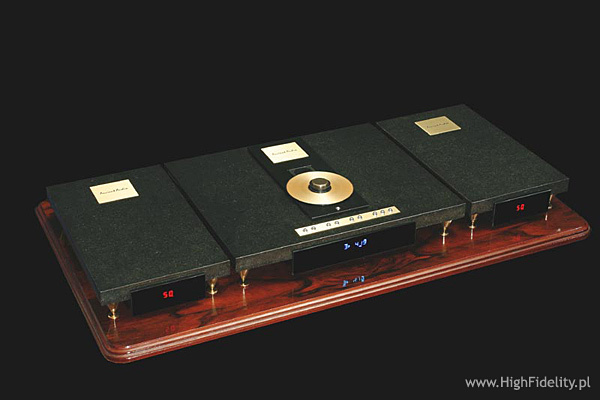 The Compact Disc player Lektor Grand SE of the Krakow company Ancient Audio is the second official version of the main model. Although in the products of the company updates are constantly made, the name remains same, until the changes are so big, that the original device is difficult to recognize. Apparently nothing has changed. This is still a product composed of three enclosures – the biggest one is the transport and the two smaller ones are mono D/A converters. All received chassis made from marble in a setting decoupling them from the floor by a layer of elastomer and strips of marble, with gold plated spikes from Monacor are attached. This configuration was first used in the Lektor Prime. The front of the transport is made from a darkened glass plate, with medium sized red LED displays mounted underneath. Those are quite OK, but they lack the functionality of the displays from Moon (see HERE), EMM Labs, McIntosh or the German company Acoustic Plan (please look at the CD player Vadi, where the same patent was applied as with the Ancient – the disc is loaded at the top and has no cover). Especially the first and the last solution is to my liking. It is similar in the converters – each has a two digit display with the amplification value on it – Grand SE is a player with an integrated preamplifier. The readings go from 01 to 99 in 1dB steps and the value 86 means the standard 2V rms on the outputs (nominal value for CD players). I should have probably started with this, but this is so obvious: the disc in the Grand SE, as well as in all products of the company, is loaded from top and although it is clamped with a messing magnetic puck it is not covered with anything. Nobody will know who was first – the Japanese from 47 Laboratory (the owner – Junji Kimura), or the Polish from Ancient Audio (Jaromir Waszczyszyn). What is important, that the same idea was born in two distant places on earth and found its followers quite quickly, for example in the form of the Kalista Metronome Technologie, or the player A1008 Musical Fidelity and the mentioned Vadi from Acoustic Plan. 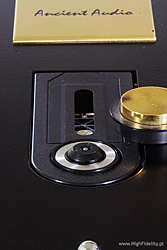 And followers mean that something special was achieved… The functions of the drive are accessed by means of small, chromed buttons (on special order the buttons can be made from jewels) located on a brass plate on top of the player, near the front panel. Those functions are doubled on the ugly plastic remote, that adds the direct track access capability, changeable time display and the volume control. I mentioned, that the disc is placed on the shaft of the motor and clamed with the puck. To load the disc, read its TOC, one of the buttons must be pressed. It cannot be done from the couch using the remote, and we will feel that having to get up and reach the player every time we forget to press the mentioned button. On the back we have lots of sockets – all main sockets like the RCA and IEC are splendid elements coming from Furutech. Unfortunately the XLRs from that company are too big and do not fit in the back plate. The transport presents the signal in three ways: RCA S/PDIF, AES/EBU (balanced S/PDIF) via XLR and separate signals for the left and right channel, with lines for the signal, additional signal, clock synchronization, etc. Those use dedicated 50ohm connectors, as used in medicine and army, also special, not very long cables are supplied, five pieces per channel. This is the best possible way to transfer the digital signal from the disc to the converters. From the converters we can take the analog signals unbalanced by RCA or balanced by XLR. 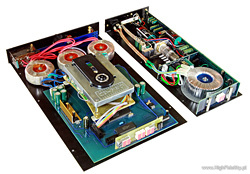 The latter was not attached to the tubes in the tested unit (although the device is fully balanced) because it was prepared to work with the unbalanced power amplifiers Silver Grand from Ancient Audio. Unfortunately no output is described. Like usual in such cases, the device look simple inside. But for this simplicity it took 15 years of work. It is important what to delete from the circuit, and where. The main change from the previous version is the power supply. That is the reason in the drive section we have three (!) 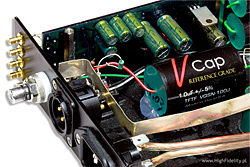 toroidal transformers, each with many output voltages. They were filled with resin with added elements looking like wood. Anyway, there are separate power supplies for the motor, servo and display. The PCB where everything is mounted there is also place for a separate supply for the laser lens, but it was not mounted. I know, that such tests were done, and that the device sounded better, but on the way something else must have been recognized… The capacitors in the power supply are not very large, but those are the same units as in the converters, coming from Sanyo and rated for 105 degrees Celsius. The drive is not screwed to the bottom, but to an anti-vibration platform from the company Base, that due to its shape and mass should dampen the vibrations of the drive. It works – I heard the device without it and it sounded worse. This is one of the upgrades awaiting my Prime. The drive itself is the trusty Philips CD-Pro2 LF (Lead Free) in the newest version with the RoHS certificate. This is exactly the same version as the CD-Pro2 M but without lead in the solder. The signal goes to a small vertical PCB at the outputs where output circuits and the splendid Tentlabs clock are mounted. The inside of the converters also looks quite simple. The devices are built based on two small PCBs (a part of the power supply and the converter) and a point-to-point network (the rest of the power supply and the output stage). The converter is surface mounted near the digital, 50 ohm inputs. The markings were removed, but it looks like coming from the Cirrus Logic factory, probably a recent delta-sigma type converter. There is no upsampling. The signal runs to a single Sovtek 6H30 tube (this is a double triode, where one triode is responsible for one of the halves of the balanced signal) and then, via a relay, to the output sockets. The signal for the RCAs comes from the positive branch of the circuit. In the sound path fantastic and terribly expensive (a few hundred dollars a piece) Teflon capacitors TFTF from V-Cap are visible. I heard the device with and without those, and I know, that they dotted the ‘I’ and placed the player on the digital Olympus. But you have to be careful with them, they need about 500 hours of burning in to reach their normal state. Fortunately I receive a fully burned in player. In the power supply a toroidal transformer was used per channel, with resin filled inside and many secondary windings. 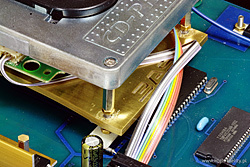 The rectifiers are based on solid state diodes and in current filtering splendid Sanyo capacitors were used. Attention is drawn by a wide silver ribbon used as a central earth point. The build quality is typical for small manufactures – in places it is very good, and in some places it looks as made by a school boy during lessons (some elements are glued to the enclosure). But this is how boutique audio is – this is fully hand made, unit by unit. However I will pick on some things, even if I would not like to. It IS a very expensive device and the criteria for evaluation must be the same as for other products. The mentioned dCS, Kalisto transport, brilliant Jadis have something in them, that we know immediately that we deal with something exclusive. And in audio – finally – we buy with our eyes open. And this is how it should be. This is a part of the luxury items, and the word luxury is not only a word here. Let’s take the spikes (the second thing) the device is placed on. I know, they are maybe good, but we have shown clearly, and with this player, that Cerapuc and Ceraball feet from Finite Elemente (report HERE) are better and I bought them for my Prime and I am not thinking about leaving them. I think, that feet of that class in a “cost-no-object” product should be a standard, even if it would only make the owner of such a device feel better. Even at a premium – with such prizes nobody will notice that. Anyway, for this model we get two remote controls – a plastic and a metal one, that will also be available for the Prime. And finally the third thing – the puck. I know that it does its function good, but it is plain and simply ugly. And it should be the visiting card of the company, with an engraved logo. Why Ayon could do that in a device costing 10 000zl (I am talking about CD-1, test HERE), or Nagra, in a much more expensive, but still not as much as a space ferry, CDC (test HERE) and Ancient could not? I know, that this is a small company, but at that kind of money, everything must be just perfect. The form of the devices maybe liked or not, this is not for discussion. The only thing that stands for this all is the incredible sound that comes from those boxes. So if you think, that sound is all that counts in audio, then the Ancient will be the best buy, because it is not badly made. But if an audio product is for somebody (like for me) a connection between the sound and the form, those remarks should be food for thought, even if after listening to the Grand SE you will not want to let it out of your hands (like I don’t).